The training workshop was conducted as the United Nations Childrenâs Fund (UNICEF) looks to establish Adolescent Media Networks throughout the sub-region and seek to equip adolescents aged 13 to 18 with the skills to be able to use the traditional media and new media platforms to reach policy makers and the general public and become active members in civic engagement. This country now joins Antigua and Barbuda, Barbados and Dominica, where similar initiatives have already been set up. Louanne Gilchrist, Chief Education Officer, speaking at the opening ceremony on Monday, August 22, said that adolescents needed to be given the opportunity to develop their creative talents. âI hope that at the end of the workshop you the youth will be able to use various forms of the media to interact and educate your peers on matters of public interest,â Gilchrist said. Frederick Stephenson, Minister of National Mobilisation etc, said that he welcomed the setting up of the Adolescent Media Network here. The Minister explained that the workshop was conducted at a time when his ministry and the Ministry of Education were undertaking several activities aimed at developing students here technologically. He reminded the participants that the workshop was just another opportunity for them and for them to become exposed to the rudiments of mass media. âMost of you are in tune with established media, including Facebook, Twitter and Youtube, but we are hoping that exposure to this type of training will facilitate new discussion on national issues relevant to youth and national development,â Stephenson said. There were several issues that confronted the youth of the nation, he continued, which included teenage pregnancy, HIV/AIDS, crime and the breakdown of the moral fabric of society. âThe youth is of great importance to the nationâs development,â the minister contended. Tom Olsen, UNICEF Regional Director, said in his presentation that according to Article 13 of the United Nations Convention on the Rights of the Child, it was the right of the child to seek, receive and impart information and ideas of all kinds. âChildren and adolescents account for a sizeable portion of the population in all Eastern Caribbean countries, and the same is here in St Vincent and the Grenadines. However, they largely do not have a voice on the national stage on issues concerning them,â Olsen explained. 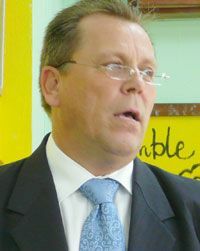 Therefore, it was becoming increasingly clear that the youth needed to be brought into the development agenda Olsen said.